For weeks iOS5 users have been complaining about battery life issues and despite various fixes by users Apple had not officially done anything to resolve it. 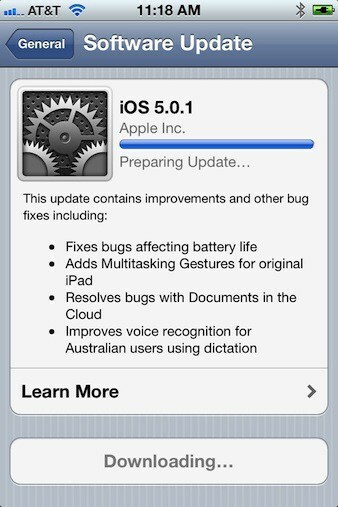 Fortunately today that has all changed with the latest release of iOS 5.01. Apple successfully managed to fix whatever was causing the various battery drain issues as well as numerous security flaws so in nearly every way iOS 5 is a worthwhile download. Even more important is the fact that users are now capable of downloading iOS 5 directly on their iPhone or iPad, it is no longer necessary to connect these devices to a computer to download the update. Unfortunately Apple did not actually announce what was causing the battery issues in the first place which is somewhat disappointing but for most users it is simply a good thing that they have been fixed. No word on any future updates beyond this one yet.